The world's first connected eWriter. How to develop a manufacturable, lightweight, 4ft tall touch surface that can replicate the functionality of a traditional paper flip chart. 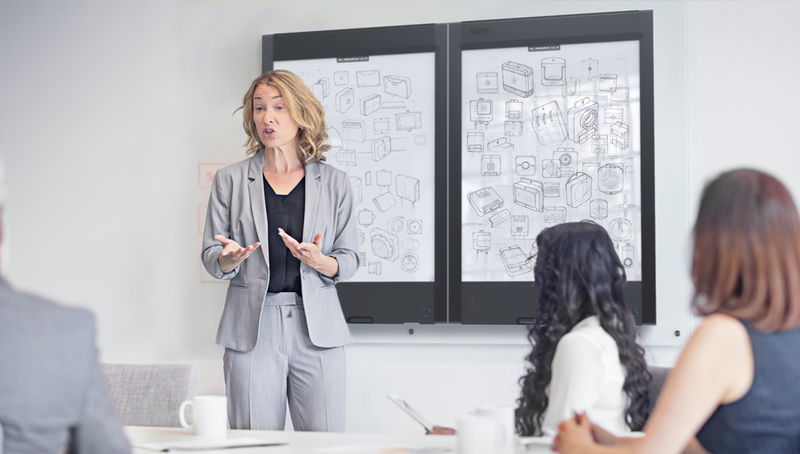 Use lightweight structural panel technology to support world’s largest e-ink display along with a quick disconnect wall mount system. Structural honeycomb layers provided flex resistance strength while the aluminum rails add protection and toughness. The e-ink display is the world's largest by a factor of 10 and the micro-thin glass with touch overlay makes replication difficult. During design of quick disconnect system, multiple rounds of user testing were done to achieve balance between form and function. A custom manufacturing process was setup and refined to perfect the final product assembly process during volume production. 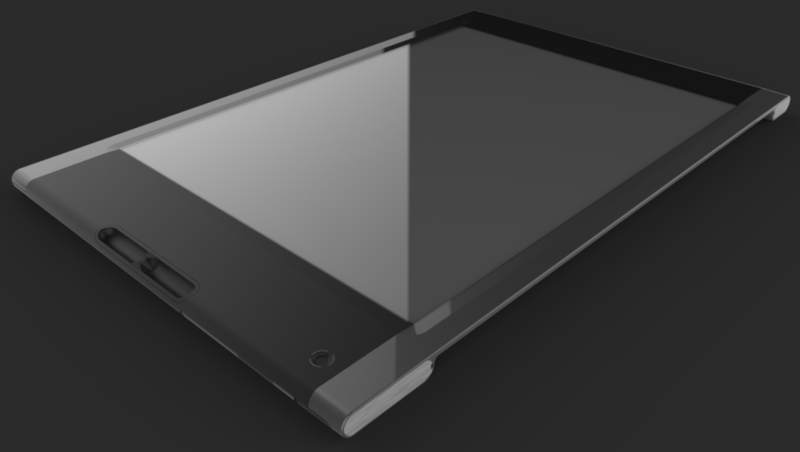 Concept design rendering of product solution. 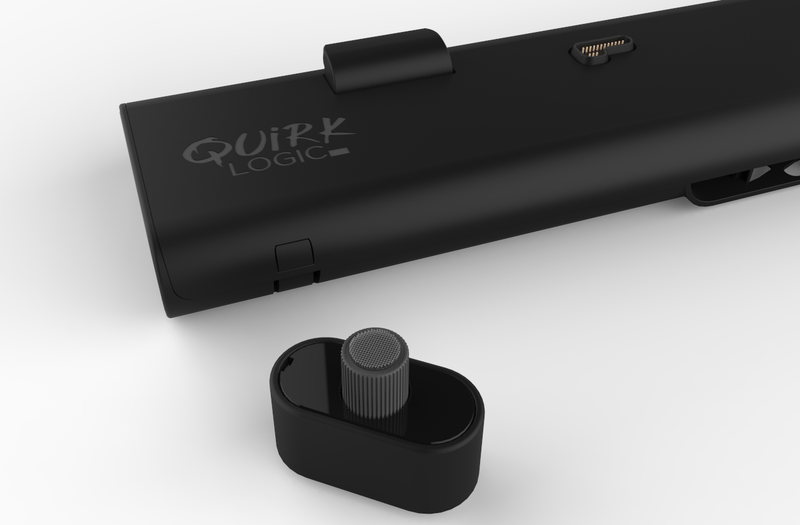 QuirkLogic came to Design 1st with multiple design requirements including e-ink technology, wall-mount, portability, screen size, weight, and desire to replicate a pen-to-paper user experience. The toughest challenge was finding a lightweight material that was strong enough to prevent screen flex and cost-effective to manufacture. The solution came after exploring materials used in marine and architectural thin structural panel solutions. Although not commonly used in electronics product design, the lightweight PP Polypropylene Honeycomb material chosen met all of QuirkLogic's design requirements. "Explore rigid panel architectural construction." Quilla parts build using in 3D CAD. "Lightweight honeycomb core, airplane wing inspired." Once a design concept was chosen by the QuirkLogic team the next challenge was integrating the solution into a manufacturable form. Starting with 3D CAD drawings we began flushing out the details and determining risk areas including screen flex tolerance, cable management, and mechanics of the quick disconnect system. To mitigate against these potential design and manufacturing risks, we worked with QuirkLogic to define the allowable screen flex tolerances and mechanics of the wall mount disconnect system. The result was a fully baked 3D model ready for prototyping. Build of Quilla prototype in Design 1st prototyping lab. Using the 3D CAD drawings and PP honeycomb material chosen, Design 1st began the tough challenge of integrating a loose tolerance paneling material into a high tolerance product assembly. 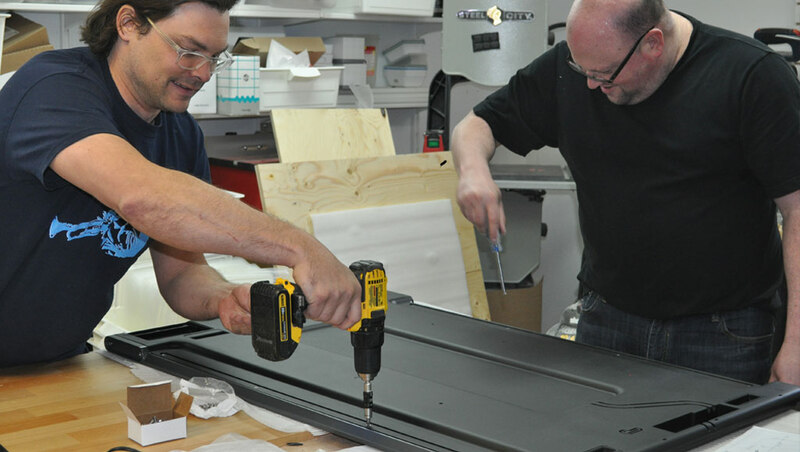 This process involved a mix of ordering and testing prototype parts along with back and forth communication with material suppliers to ensure everything came together. The end result were several fully functional prototypes ready for user testing. These prototypes were fully assembled in the Design 1st prototype lab then carefully wrapped and shipped to QuirkLogic for field testing with potential consumers. "Loose tolerance materials, high tolerance product." "Guidance through pre-production tuning process." After refining the cable management and manufacturing tolerances of specific parts for the pre-production prototype, Design 1st began working with part suppliers and the manufacturer to develop a high quality assembly process for predictable volume production. The only hiccup during the assembly was the side rail parts were warping due to heat during molding. Design 1st quickly identified this issue and designed a cooling jig to improve part quality. This was followed by continual back-and-forth communication with the manufacturer to develop a high-quality process that would output consistent production results.